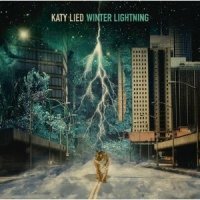 I'm not sure whether it is Katy's propensity for not telling the truth, however there can be no doubt that 'Winter Lightning', which is the third album from Katy Lied has over the last few weeks led me astray. Instead of moving on to other albums that I have either been sent for review or purchased, I continually find myself being tempted back to the glorious vocal tones of Katie Harnett, which adorn a gently eclectic set of songs, lovingly crafted by guitarist Duncan Hamilton and producer Nigel Stonier. Harnett really does have a voice that could carry the least exciting of tunes and make it stand out, so having her Nancy Wilson meets Allanah Myles style front an album's worth of material which is also of the highest calibre is a real delight. Tinged with just a touch of blues and the merest sprinkle of country, Katy Lied make the sort of music that will appeal to serious rock fans, whilst having the crossover appeal that should, all things being fair, result in mainstream success for the band. What makes that all the more impressive is that it is a trick that the band pull off whilst never compromising their rock roots. Right from your very first listen to up tempo songs such as album opener 'Drivin' The Miles', 'Go Too Far' or 'Wrong Turn' it is impossible not to be seduced by the sparkling guitar hooks and insistent rhythm work from bassist Jo Wadeson and drummer Paul Burgess, with everyone from the likes of The Travelling Wilburys, The Replacements and Allanah Myles being brought to mind. All of these songs are catchy and melodic, having you grinning from ear to ear as you latch onto all the hooks that were made to snag even the most resistant of ear, however it is the changes of tempo and focus that pepper this album which really raise 'Winter Lightning' well above the ordinary. 'Never Gonna Run' has the fuzziest, dirtiest riff on the disc, giving as almost Sonic Youth vibe, while the beautiful acappella version of the title track not only has a stunning, passionate arrangement, but offers a stark contrast to the electric version of the song which closes the album out in fantastic style. Running at just under forty minutes, 'White Lightning' is a little short, but it really is an ever so sweet journey that satisfies on so many different levels and I wouldn't be exaggerating to suggest that it deserve to make Katy Lied a household name. Katy may have lied, but I'm a believer!